In preparation for the upcoming FY20 defense authorization and appropriation cycle, this memo offers background information regarding a proposed “low-yield” nuclear arsenal. As a contentious matter in our national defense debate, this arsenal will likely be a salient issue in the upcoming Congress. Congressional Democrats, particularly leadership in the House Armed Services Committee, oppose the Trump Administration’s current effort to incorporate low-yield nuclear weapons in the United States’ nuclear triad and posture. We recommend you support their legislative effort to deauthorize and defund these weapons’ development. “Low-yield” (or “tactical”) nuclear weapons are nuclear explosives intended to achieve localized, “minor” destructive effect. Cold War-era low-yield nuclear weapons had a maximum yield comparable to roughly 10 times that of the nuclear bomb used over Hiroshima, but could be “dialed back” to a fraction of it. Relative to strategic nuclear weapons, low-yield nuclear weapons may be more portable – mounted in artillery shells, short-range ballistic missiles, or carried by fighter aircraft – and can be hosted in-theater to enable more rapid deployment and use. Historical and theoretical nuclear doctrine calls for low-yield nuclear weapons to be used to soften entrenched enemy positions, slow massed enemy advances, and/or minimize civilian casualties in areas of strategic importance which carry high risk of collateral damage. 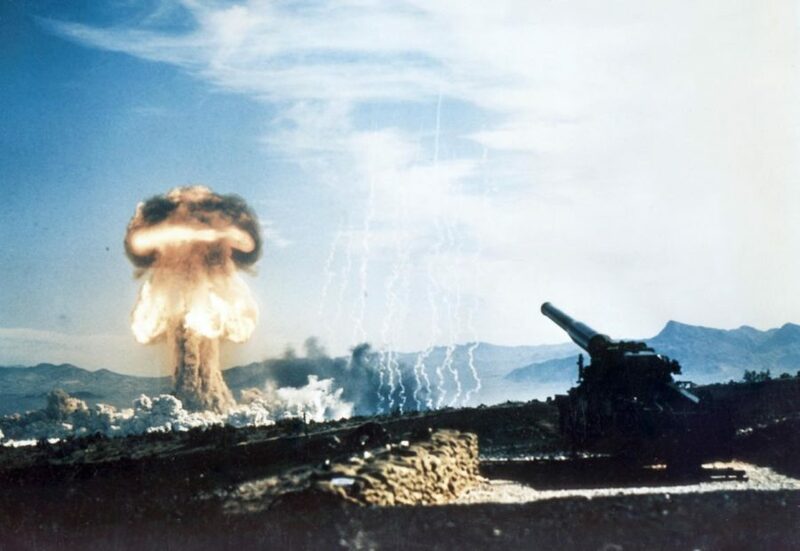 The United States maintained a low-yield nuclear arsenal throughout the Cold War, deploying it in Europe to deter and stall a Soviet military invasion. The arsenal has been dramatically reduced since the end of the Cold War, with approximately 150 bomber-deployed warheads remaining in operational service. While successive administrations had rejected proposals to reinvigorate the low-yield nuclear arsenal, apparent changes in the Russian nuclear doctrine prompted a strategic recalculation within the second-term Obama Administration and the Trump Administration. Russia has reportedly shifted from a “no-first-use” nuclear weapon policy to that of “escalate-to-deescalate.” Under this doctrine, Russian forces would employ low-yield nuclear weapons during early stages of regional conflicts (i.e. an invasion of the Baltics or Caucasus) to effectively deter a NATO response, lest NATO be the first to escalate the conflict into strategic nuclear warfare. The Trump Administration’s 2018 Nuclear Posture Review called for the development and deployment of an American low-yield nuclear arsenal to proportionally match and counter that of Russia’s. This position became manifest in the FY19 National Defense Authorization Act, signed into law, which authorized the development and deployment of submarine-based low-yield nuclear warheads hosted on Trident ballistic missiles. The FY19 defense appropriations bill, expected to be imminently passed by Congress and signed into law, provides $65 million for this effort. In response, Congressional Democrats have recently introduced legislation – the “Hold the LYNE” [Low Yield Nuclear Explosive] Act – to prohibit research, development, and production of submarine-based low-yield nuclear weapons. We anticipate that this legislation will serve as the basis of further efforts in opposition to this class of nuclear warhead during the FY20 defense authorization and appropriation cycle, especially if Democrats secure a majority in the House of Representatives and/or the Senate. Proponents of low-yield nuclear weapons suggest that the lack of parity between the American and Russian nuclear arsenals for this class of weapon undermines – or defeats entirely – traditional nuclear deterrence. Russia’s “escalate-to-deescalate” doctrine is designed to exploit the lack of an equivalent or proportional American response and test American thresholds of escalation. Without a credible capability for low-yield nuclear retaliation, the United States would be forced to either disengage, engage entirely with conventional means (which could not match the military efficacy of a nuclear explosive), or escalate to the use of the strategic nuclear force. Any of these options would be both tactically ineffective and strategically unattractive during a time of war against an adversarial nuclear-capable power – practically, and in terms of “messaging” for both allies under the United States’ nuclear umbrella and opponents whom nuclear engagement would seek to deter. Nuclear weapons have not been used in conflict since the waning days of the Second World War; while military theorists and analysts may suggest possible “ladders” of escalation and the short-term strategic calculus of nuclear weapon use, it is entirely unknown how such weapons will be employed once the threshold of their first-use has been crossed. Muting Russia’s “escalate-to-deescalate” doctrine should not be done through the means of low-intensity nuclear warfare, in which thresholds of continued escalation have not been clearly communicated and risks of miscalculation are high – and, of course, costly. Conventional warfare between peer competitors has been staved off in the nuclear era because of the “mutually ensured destruction” deterrent. Deploying an American nuclear capability intended for battlefield, “conventional” use would fundamentally alter perceptions of acceptable nuclear weapon use and consequences. Lowering the threshold of American nuclear weapon employment from the “strategic” to the “tactical” not only justifies Russia’s holistic military doctrine – of which “escalate-to-deescalate” is simply a part – but transforms the nuclear arsenal’s stabilizing effect (be it real or perceived) of being an “end-all, be-all” response to military transgression into yet another system for use on the battlefield. Opponents of the current low-yield nuclear weapon development effort point to the impracticality of hosting such warheads on submarine-launched ballistic missiles. Given that submarines serve as the United States’ strategic “second-strike” nuclear force, it will be challenging for an adversary to discern whether a particular submarine-launched warhead is “tactical” or “strategic.” In the short timespans inherent in nuclear warfare, this may lead an adversary to rationally presume that full-out nuclear warhead has begun and employ their entire nuclear arsenal. If – not to mention should – low-yield nuclear weapons be deployed, they must be deployed on platforms which are clearly communicable to the opponents they seek to deter or counter. We recommend you support and sign the Hold the LYNE Act and oppose the development of submarine-launched low-yield nuclear weapons. Nuclear warfare is too risky an endeavor for the United States to engage in without clearly understanding the potential for escalation; the nuclear deterrent too valuable a tool to “make cheap.” In place of these weapons, we recommend that you advocate for the Administration to make clear its respect for true, historical deterrence – that any adversarial use of nuclear weapons will be met with a non-proportional strategic nuclear response.